When I received an invitation to my friend’s New Years Eve party, I immediately knew I wanted to try some sort of chocolate cupcake with salted caramel frosting. Afterall, everyone loves the salty sweet combination, and even if they didn’t like it, since it’s New Years Eve they should have consumed enough alcohol to pretend to like it. Fortunately for me, there was no pretending, and guests were even asking if they could take cupcakes home with them. Success! Since I already have the perfect (and one bowl!) chocolate cupcake recipe, I used that. For the frosting, I spent a bit of time Googling different recipes and finally decided on Chockylit’s recipe. It was a little time consuming because you have to make the salted caramel before starting the frosting, but it’s definitely well worth the time it took. In other news, notice the bright blue background and lack of kitchen sink in the photo? My parents bought me this mini photo studio for Hanukkah, so now I can post photos that don’t include my ugly stained Formica counter top. You can thank me (and my parents) later. Combine the water, sugar, and the corn syrup in a deep saucepan and cook over medium heat. Stir together with a wooden spoon until the sugar is incorporated. After 3 minutes, remove the lid, increase the heat to medium-high, and bring to a boil. Do not stir from this point on, but it is important to carefully shake the pan so that one area of the caramel doesn’t burn. Pour the heavy cream into the mixture. Wear oven mitts, stand away from the pan, and be careful. The mixture will bubble up significantly. Bring butter to room temperature by letting it sit out for 1 or 2 hours. Sift 3 cups of powdered sugar into the butter/cream cheese mixture and beat to combine. 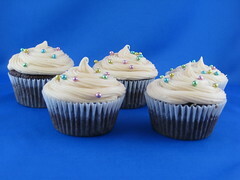 Frosting recipe from Cupcake Bakeshop by Chockylit. The cupcakes look delicious, but that photo studio thing is so dang cool! These look amazingly good. I really want to make cupcakes, because they offer so many decorating options (and I’ve made way too many cakes lately). i’m not sure i can continue to subscribe to your blog. it is detrimental to my weight-loss plans…. lol! these sound so amazing. “Salted caramel” are two of the most beautiful words in the english language. along with “homemade fudge” and “handmade pies” …don’t you think? Salted caramel might be my favourite thing, next to chocolate, raspberries, icecream and cake. I’m thinking of finally making these tonight, so I can bring them to a friend’s house tomorrow. Do you remember about how long it took from beginning to end? Thanks! @Seanna Lea – You could do these in about an hour I think. The cupcakes are made in one bowl, so the bulk of their time is baking. While they’re in the oven, make the frosting and by the time the cupcakes are cooled you should be good to go! I made this same frosting from chockylit and my frosting was a little softer than I like. However, I didn’t want to keep adding the powdered sugar and lose all the salted caramel goodness. What did you think of the consistency? Hi! I really want to make these for my upcoming housewarming party. How many cupcakes will the frosting frost? thanks!